In 1935, a young woman by the name of Adelia Green began a work in her home. After seventy-three years, that work is known as Genesis Full Life Fellowship Church. Here is some history of how we got here. In the late 1920’s and early 1930’s, Bishop G. T. Haywood, the first Presiding Bishop of the Pentecostal Assemblies of the World, Incorporated had been preaching the Oneness doctrine, which found its way to the great state of Texas. Sister Green heard the word and was both water baptized in the name of Jesus, and Spirit-filled. Ultimately, she joined the Greater Lincoln Park Church. She was later called to preach. Sister Green married Elder William Smith, a man of God with the gifts of faith and laying on of hands, who ministered with her. 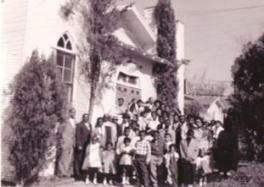 In 1935, Sister Green began a church in their home on the corner of East Houston and Pine Streets. In 1936, the first church building was erected on the vacant lot next to the home. After much complaining by the next door neighbors, the church was moved to the corner, and the home to the vacant lot. The Church was named Faith Temple Apostolic Church after much prayer and fasting. On August 9, 1947, Pastor Adelia Green passed away. Elder Smith (who had stated that he was not a pastor) served as the leader of the church for several years. He was an excellent teacher and instructor in God’s word. He married Evangelist Marie Smith, of Columbus, Ohio, and she carried on as interim pastor. However, before a pastor could be found, Elder Smith (Pop) passed away. In 1959, Evangelist (Mom) Smith heard of a young man from Grand Rapids, Michigan, by the name of Elder Horace M. Young. She invited him to come to preach during revival services. He accepted the invitation, and God richly blessed his people during the services. He was asked to come to Texas to assist in the leadership of Faith Temple. After seeking God for direction, Elder Young and his wife, Sister Mildred Young, moved their family (with the exception of the 3 eldest children) to San Antonio. While assisting Mom Smith, Elder Young was elected pastor of the Oneness church in Seguin. 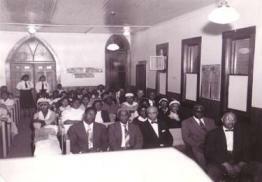 In 1961, he was installed as pastor of Faith Temple. He served as pastor of both churches for several years, before turning the church in Seguin over to Elder Elroy Smith, who remained as pastor of the church until his death in 2008. Upon the death of Mom Smith, the home, now called the Smith Building, was used during the week as a licensed daycare center, and on Sundays as classrooms. It also eventually housed the pastor’s office. During the late 1980’s, the church was incorporated by the state of Texas under the name of Greater Apostolic Faith Cathedral, but after some consideration, it was renamed Greater Faith Temple Apostolic Church. In its lifetime, the building at 1731 East Houston Street has undergone several renovations. In 1992, a major renovation was accomplished, and in February 1993, the church was rededicated. In 1995, after being the pastor of Greater Faith Temple Apostolic Church for over thirty-four (34) years, Pop Young resigned as the result of ill health. He passed away on July 18, 1996. Mom Young continued as a faithful member until her death in June, 2006. In June, 1996, Elder Douglass Thompson was installed as the third pastor of this great church. He is a mechanical engineer, with a Masters Degree. Elder Thompson resigned from his high-paying job in Tennessee, and he and his wife, Sister Jessie Thompson, moved to San Antonio with their four daughters. He was determined to follow God’s plan for his life. He was consecrated to the position of District Elder in June, 2001. In March, 2009 he was once again elevated and consecrated to the office of Suffragan Bishop. He is a pastor with a vision, who has continued to lead the members of what is now incorporated as Genesis Full Life Fellowship Church, Inc. Phases II and III are a reality. We continue to trust God to bring the complete vision to pass.